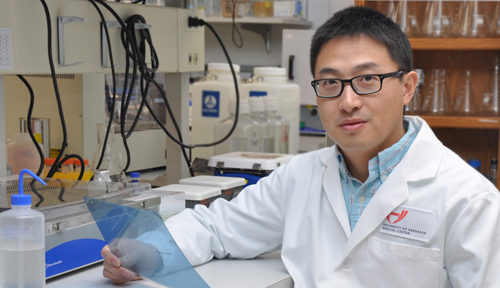 Meet UNMC New Investigator Aimin Peng, Ph.D.
An important research question I ask is: "How our do cells respond to DNA damage? In particular, how do the cells determine their fate after DNA damage?" Radiotherapy or chemotherapy kills cancer cells primarily through induction of DNA damage. Thus, mechanisms that allow cells to recover from the DNA damage response and return to cell proliferation are critical for tumor recurrence and ideal targets for cancer therapy. We hope to reveal the mechanism of DNA damage recovery and tumor recurrence after chemotherapy and thereby provide better understanding of chemoresistance, potentially leading to more effective cancer therapeutics. From old Chinese wisdom: He who gives no thought to far-flung problems soon finds suffering nearby. I am a good experimentalist in the lab but not very handy at home. My wife and I went to the same elementary, middle, and high schools.